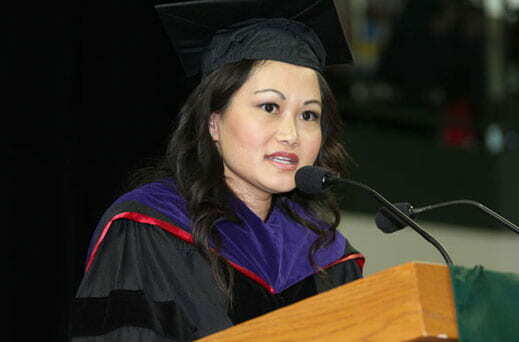 Award-winning alumna Ma Manee Moua shared practical advice with about 650 graduating seniors and a crowd of nearly 5,000 at UW-Green Bay’s spring commencement May 18 at the Kress Events Center. With today’s challenging job market, she told the graduates, they’ll need all the confidence, determination and skills they can muster. Moua graduated from UW-Green Bay in 1999 and went on to earn a law degree from the University of Wisconsin Law School. She went on to become an assistant attorney general with the state of Wisconsin Department of Justice, where it was believed she was the first Hmong American to serve in such a capacity in any state justice department, nationwide. Today, she operates Moua Law Office in Roseville, Minn., a Twin Cities suburb, with a second office in Appleton. While she found success both in college and afterward, Moua told her audience that she never forgot that she came from a modest background, a family more “have not” than “have.” She would have to work hard for everything. That was especially true in pursuing a law career, a profession relatively foreign to traditional Hmong culture where clans and families settle most disputes locally and informally. Moua shared a story from one of her first cases as an assistant attorney general, when veteran attorneys commented on her youth. One way to achieve that confidence is through continuous learning, she said, adding “Always do your homework.” With the internet and other tools, she said, the UW-Green Bay values of critical thinking, creative problem solving and looking at issues from different perspectives are often just a keystroke away. Moua earned Alumni Association Outstanding Student Award honors as a graduating senior. She also received the University’s young alumni award in 2007. This entry was posted in News and tagged achievements, alumni, commencement, speaker on May 18, 2013 by Christopher Sampson.